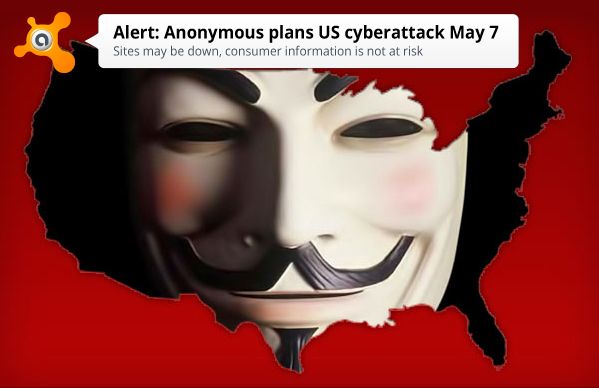 The hacktivist group Anonymous announced phase one of a massive cyberattack, called Op USA, on U.S government and banking websites scheduled for next Tuesday, May 7. The White House, the NSA, and the FBI are included on a list of high profile government targets, and 133 financial institutions including the Bank of America, Wells Fargo, and Citibank are listed as banking targets. Communicating through Pastebin on April 21, an Anonymous spokesperson stated, "Anonymous will make sure that this May 7th will be a day to remember.” They wrote that the reason for the attack is "…multiple war crimes in Iraq, Afghanistan, Pakistan…”. Bank Info Security writes in an article that “Experts say the threat is serious and few of the targeted organizations, have made significant investments to withstand the attacks.” Other than the top 50 banking institutions, smaller banks are not prepared to withstand the traffic surges that a DDoS (distributed denial of service) attack brings. "The smaller banks are not prepared, and the government side is not very well prepared, either," says an Israel-based DDoS-mitigation expert. "If a massive attack will come, I'm sure we will see many of the government websites going down." If the threat is manifested, then banking customers may find their bank's website inaccessible for a time due to the abundance of junk traffic being sent by the attackers. There should be no risk to your personal information or accounts due to these politically-motivated attacks. Just keep a close eye on them, and report any unusual activity. And please take all the normal precautions - Use strong, unique passwords on your accounts, keep your machine's software patched, and have reliable protection like avast! Antivirus.